If you want to get a large nailing project done quickly and accurately, there’s no substitute for the best nail gun. Before thinking about any kind of nail gun purchase, though, you need to clear about exactly what you’ll be doing with it. With so many different types of nailer on the market, if you go in blind then you’re highly likely to end up with the wrong type of gun. You’ll need to think about the type of wood you’ll be using and it’s overall dimensions. Consider the scope of projects you’ll be carrying out. If you’re looking for a nail gun for the finest and most involved woodworking, you need the best brad nailer and that’s what we’re here to help you achieve today. Today, we’ll walk you through all aspects of getting the right brad nailer the easy way. These tools are not particularly complex. As long as you take the time to assess your needs, it shouldn’t be tough to get yourself an affordable, dependable brad nailer even if you’ve never used one before. The Stanley TRE550Z is our top pick in the brad nailer category because of its extremely compact gun that nevertheless delivers more than serviceable firepower and best value for the money. Perhaps the most common type of brad nailer, you’ll need an air compressor in order to use one of these powerful units. It’s crucial that the PSI and volume of the air compressor is equal to or outflanks that of your nail gun. While these nailers are generally cheaper to buy, you’ll need to think about the cost of the air compressor when budgeting. Some nail guns come with a rechargeable lithium-ion battery meaning you won’t need an air compressor at all. Technology has advanced so you can now expect decent run times and more than serviceable power levels from battery-powered nailers. With this type of nailer, you use a disposable gas cartridge and a battery so you drive your nails using combustion. These are for heavy-duty nailing jobs so you won’t get a brad nailer powered like this. With no shortage of choice when it comes to nail guns, we’re here to streamline your buying decision and make sure you get the best brad nailer for those intricate finishing projects. We’ll get straight down to business now with a detailed look at the best brad nailers for your home workshop with one model thrown in that’s tailor-made for use in a commercial backdrop. Whether you enjoy a bit of home DIY or you’re a keen woodworker, you’re sure to encounter projects where there are simply too many nails needed to work efficiently with a hammer. If you invest in the WEN 61720 18-gauge brad nailer, you can sidestep that headache completely and get the job done quick smart without sacrificing accuracy or quality. I almost didn’t want to buy it because it was so inexpensive. I mean, how good could it be? I have no regrets, we just hung an entire wall of shiplap with this and I have nothing but good things to say about the product. No misfires, no double nails, no issues what so ever. If you need a nail gun, just go ahead and buy it. Save yourself some money, you don’t need anything more expensive. Finish nailer or framing nailers are all well and good when the going is heavy, but there’s no substitute for a brad nailer when it’s time for lighter finishing. First thing’s first, you’ll need to hook up this brad nailer to an air compressor. 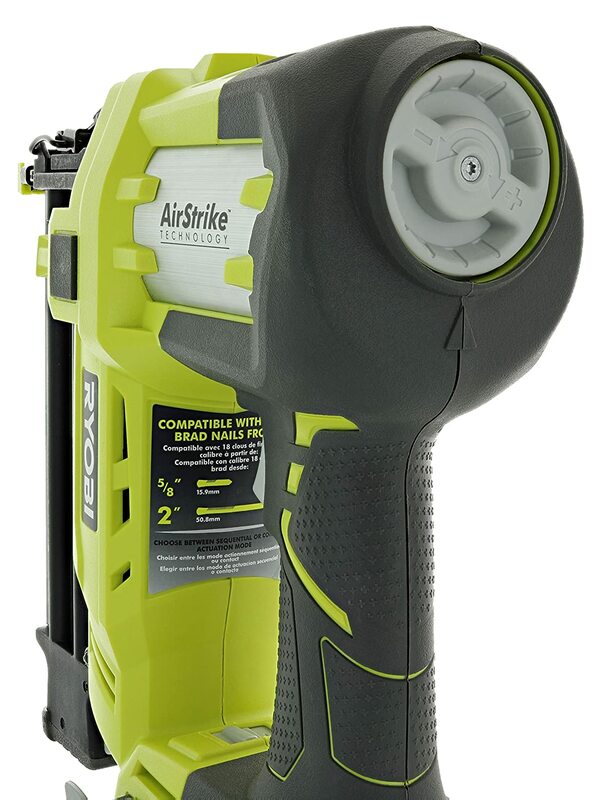 It’s amazing how many people steam in, buy a tool like this and then throw their hands in the air at home when they realize there’s no compressed air to power it with. Don’t make that mistake. Since the brad nailer won’t need a costly motor, the price comes down there and then saving you money before you even get started. But that’s not all… You’ll also be able to work for longer in unbroken spells without straining yourself using a lighter nailer like the WEN. And if that wasn’t enough, you’ll also get more power than a gas or electric gun would deliver so the modest investment in an air compressor pays serious dividends. While the WEN is cheap, you’ll get plenty of flexibility. Use dinky ¾-inch brads for those intricate finishing jobs or ramp it on up to 2-inchers if you’ve got a more robust project with more substantial nailing needs. When you need a little more firepower, just use the ¼-inch NPT inlet and hook up your favorite hose and compressor. You can ramp the pressure right up to 100 PSI which should be ample for most reasonable needs. Always keep in mind when you’re looking for a nail gun that the intended purpose is to save you time and effort. The very last thing you need is a gun that ends up such a grind to use it ends up discarded. Not only is the WEN featherlight, you’ll be able to hold the rubberized grip for hours without blistered hands even if you’re not wearing gloves. You can make small adjustments to the nailing depth you want to drive you nails using a neat little wheel. Since the magazine window is see-through, there’s no more guesswork to reloading and no more firing blanks. Maintenance is stress-free. There’s some oil in the package and all you’ll really need to do is oil your gun from time to time and you’re away laughing. Keep on top of this simple task and you’ll get far more lifespan from your nailer. Safety is uppermost with the WEN. There’s a contact trip which forces you to press your nailer against the workpiece before it fires into action. This trip also minimizes the chances of misfiring as an added bonus. In spite of this attention to detail, a few users have still griped about issues with misfiring, double-firing and pairs of nails being fired simultaneously. There’s one other drawback well worth pointing out and that’s the unsightly holes and dents you’ll be left with on either side of the nail. If you’re looking to carry out some cabinetry or any other projects where the finest finish is imperative, you’re better off looking elsewhere. If, on the other hand, you want an inexpensive brad nailer from a brand you can trust with a decent warranty and customer service, the WEN makes perfect sense. 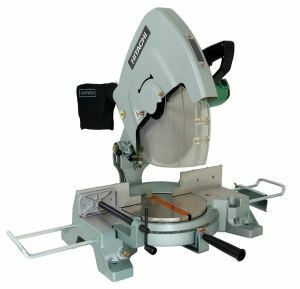 If you’re a DIY hobbyist or a casual woodworker with a pretty limited budget, the WEN 61720 is a wise bet. All you need to do is a single project and you’ll recoup the modest investment with the time you’ll save. Check out the 61720 for a great entry point into the world of brad nailers. Not everyone wants a brad nailer that cries out for a dedicated air compressor and if you’re after an all-in-one unit from an industry legend, this bright yellow beauty is a must. 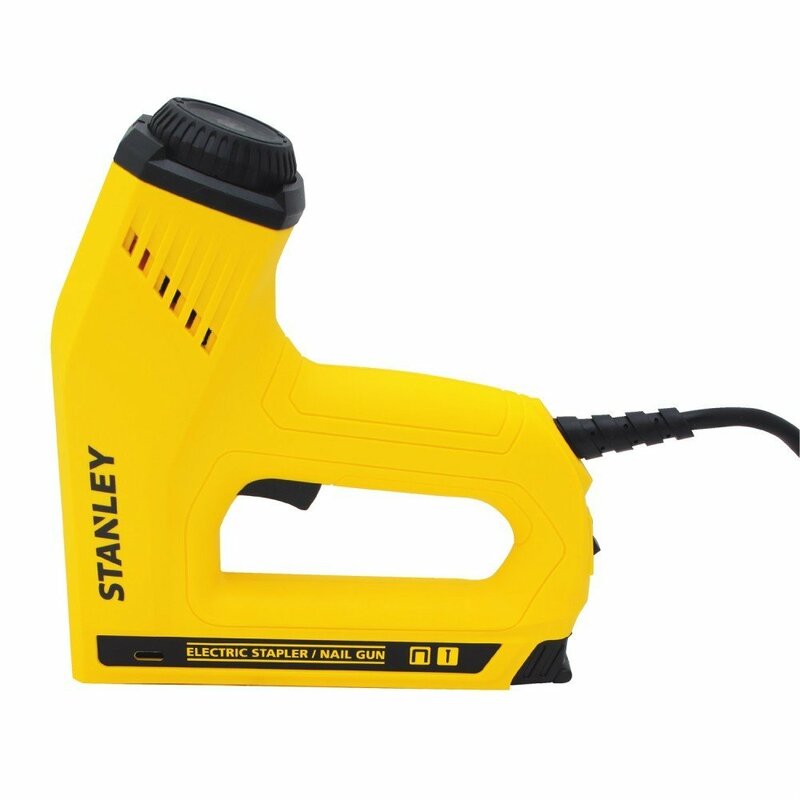 Stanley and BLACK+DECKER merged back in 2010, and the new powerhouse continues to serve up extremely solid power tools at very reasonable prices. There’s a reason these tools are staples on job sites the world over. In this Stanley brad nailer review, we’ll give you the honest lowdown on this nailer’s strengths and weaknesses so you can see if it deserves a place in your toolkit. Before anything else, how about the basic features? This staple gun is called heavy duty for a reason. This thing is built to withstand a tornado or possibly the apocalypse. As a result, the staple gun is fairly heavy compared to light duty models. Also, if you have small hands you may have trouble stapling because the handle is fair distance apart from the main part of the staple gun. It also takes some muscle to activate the staples. 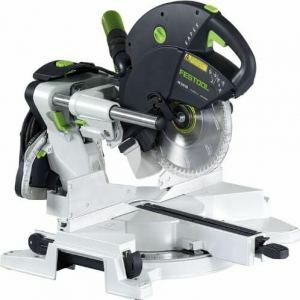 We should advise you straight off the bat not to be confused by the budget-friendly price tag… You certainly won’t be getting budget performance with this capable little nailer from a power tool legend. Whether you’re just starting out or a more experienced woodworker, this agile gun is just the ticket but what does it do so well? This is a design-driven nailer with a snub nose so you can angle your way into even the most awkward spots. The handle is comfy enough to use for extended spells without ripping your hands up. The overall feel of this nailer is far beyond what you’d expect at this price point. For staples, you’ve got Stanley SharpShooter and Arrow. You can use ½-inch, 5/8 inch and 9/16 inch brads as well so you’re fully covered for all projects with the Stanley. The nifty Hi/Lo mode lets you work just as easily with hard or soft work by adjusting your gun’s penetration power. Many more expensive brad nailers lack this thoughtful extra. One clear-cut advantage of electric nailers is that you can sidestep the need for a separate air compressor saving you money right out the blocks. On the flipside, you’ll need to be near an electrical outlet at all times and you’ll also be limited in terms of movement by the length of the power cable. The added insult with the Stanley is a cord cut woefully short at just 8 feet. There’s really no excuse for a brand like Stanley cutting corners like this. While you might instinctively assume an extension cable neutralizes that issue, sadly you’ll experience a noticeable dip in performance even if you use a heavy gauge cable. All this could have been avoided with a few feet more of cable. Reloading your gun is super-simple. You’ll be able to keep your eye on how many nails remain through the viewing window before popping in fresh nails or staples. You shouldn’t experience too much in the way of jamming with this gun over and beyond what you’d expect from any nailer. In the unlikely event of a jam, restart the mechanism and it should be swiftly cleared. You’ll get a lifetime warranty with this brad nailer but this is invalidated if you end up maltreating your gun. Take care of it well and, even though there’s a fair amount of plastic, you should get plenty of faithful service from the Stanley. If you understand up front that this nail gun is designed for less ambitious projects and you keep your expectations reasonable, you’re in for a real treat with the Stanley TRE550Z stapler and brad nailer. As long as you’re aware of the shortcomings, if you want a rock-solid little nailer from a brand you can rely on, road test the Stanley today and start getting through your nailing projects shotgun-style. Whatever your trim carpentry needs, there’s no better ally than the best brad nailer. When you’re fixing pieces of wood together when you’re working with moldings, doors, or casings, a brad nailer transforms and also speeds up an otherwise tedious job. 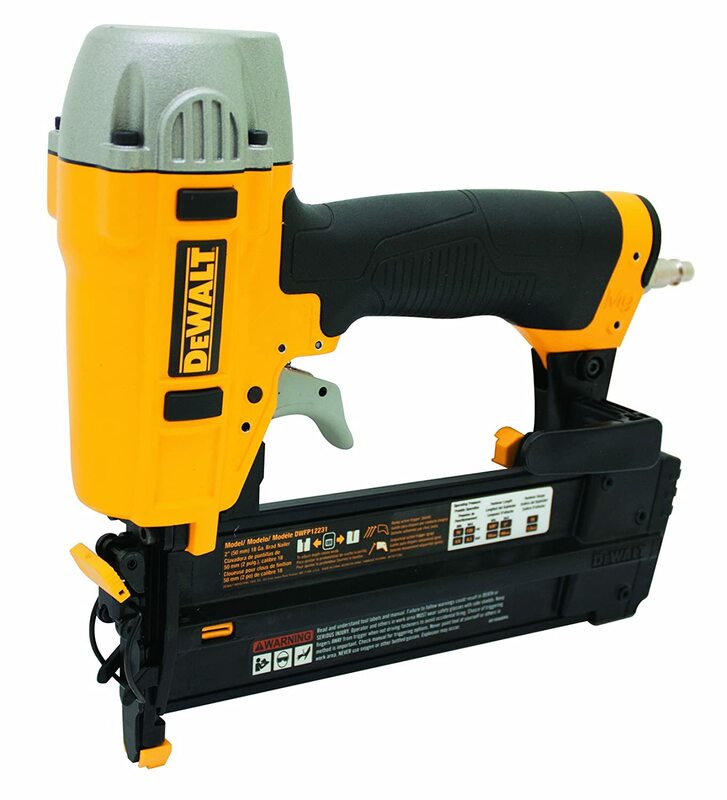 This is the homeowner/consumer model of this nailer, and it is probably not adequate for professionals that use it all day long, 40 hours a day. The little black rubber rectangles on the side have fallen off, for example, and the case is not as solidly constructed as you might find on the 3-times-this-price professional version. While this brad nailer is marketed pretty squarely at home users, you’ll be able to put it into action on the jobsite without too much concern. 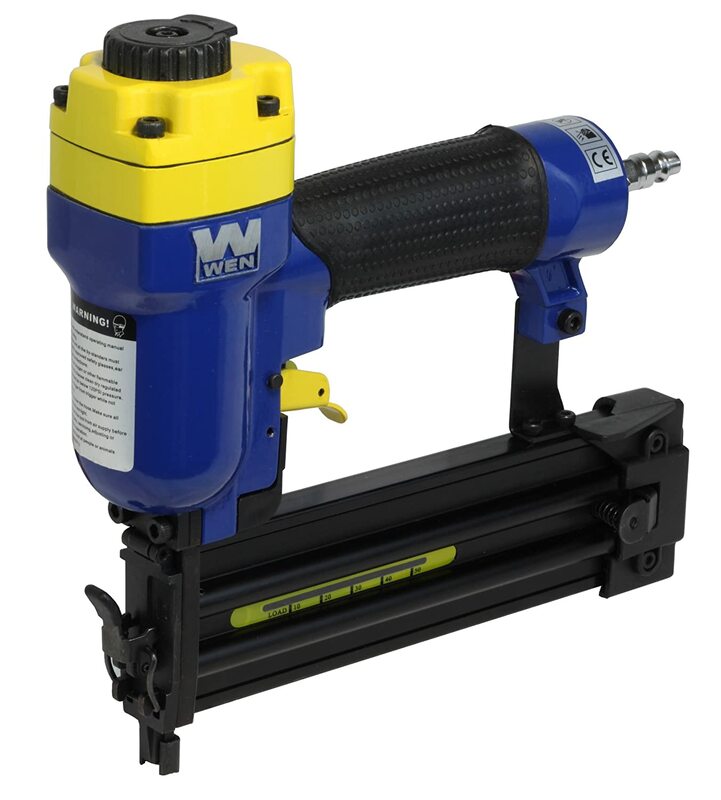 We’d describe it is more of a heavy-duty residential nailer rather than a straight-up commercial model but it’s surprisingly robust. With a body made from magnesium, you’ll get a winning combination of durability and portability. Tipping the scales at a mere 2 ½ pounds, you’ll be able to keep going for hours without feeling the strain. This is ideal since the last thing you want in a labor-saving device is something that ends up as almost a handicap. You’ll need an air compressor in place to use this brad nailer. You can easily get a 1-gallon DeWALT compressor but any one will do. There’s no need to buy this branded version if you’ve already got a compressor in the workshop. 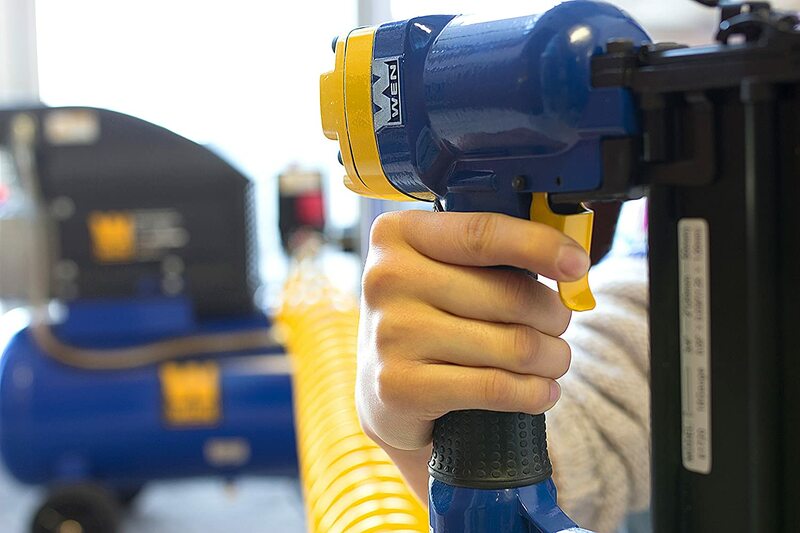 As long as the compressor you’re using can generate from 70 PSI to 120 PSI, you’re all set. If you’re beavering away and you need to manipulate the drive depth, you can do this without fumbling around for your toolkit. Detents streamline the process of setting your nail heads. These time-saving touches add up over the course of a project and the DeWALT really does make you glad you invested. Any type of brad nail fit into this gun so you won’t be tied in to proprietary nails that often cost a disproportionate amount. Whether it’s dinky 5/8-inch nails or 2-inch whoppers, any brads will do. The magazine is a side-loader good for 100 brads. With 500 free nails tossed in, you can get working straight out the box without needing to hit the hardware store. There’s a non-marring nose tip which can be removed if necessary. The exhaust is neatly tucked away at the back removing another danger to the cleanliness of your workpiece. These little extras are appreciated and allow you to save time and money without compromising the integrity of the end result. If you do want to take this nailer out on site with you, there’s a protective hard case included. DeWALT are famous for their excellent 3-year warranty and this gives you a nice added layer of confidence in a first-rate product. If you’re looking for a dependable and lightweight brad nailer you can use for prolonged spells without burning out yourself or the gun, this DeWALT is tailor-made. When you consider the expected lifespan and intended purpose of this awesome tool, it’s amazing you can get it at this price so what are you waiting for? 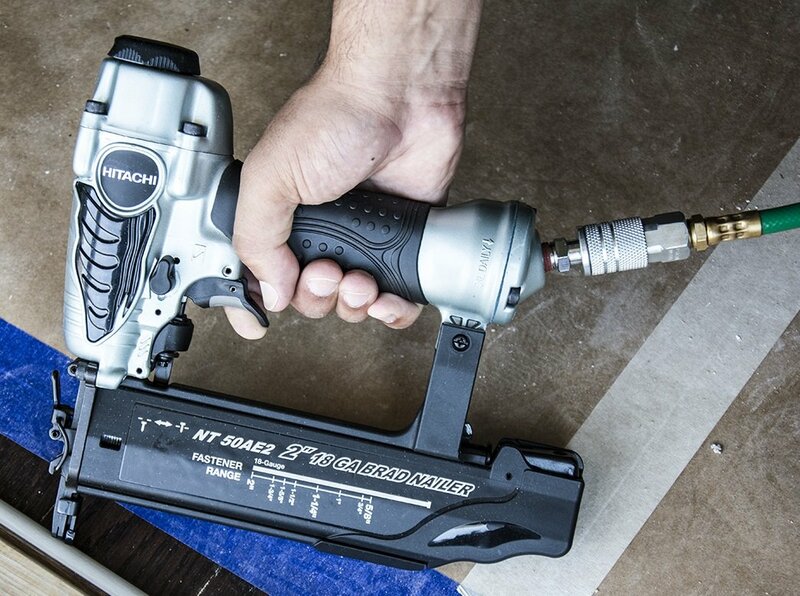 As we near the end of our brad nailer reviews, we’ve got an enduringly popular 18-gauge gun from the highly reputable Hitachi. This nailer is already priced very keenly but if you act now, you can get a very aggressive discount saving you even more money before you start saving time on your nailing projects. I purchased this product based on price more than anything. I placed shoe mold thorough out my 1700 sq ft house. I was nervous based on some of the reviews but this product did exactly as it was suppose too. I can’t put it down. I have completed multiple jobs (household chores, arts and crafts, etc) and am completely satisfied. No issues with angles or anything. With the right settings, it counter sinks perfectly. The ability to use different nail/brad sizes is also a huge plus. You expect a whole bunch of sacrifices and corner-cutting with cheap, lightweight nail guns but Hitachi break the mold with this highly capable budget brad nailer. Weighing a skimpy 2 pounds, this aluminum-based gun manages to come across as lightweight without feeling fragile. Look after your nailer well and you’ll get plenty of use from it. While overall build quality is pretty impressive, it’s worth pointing out that there’s a fair bit of plastic out to play so handle your gun with care and keep your expectations of lifespan realistic. This is a nice option and allows you to buy just what you need to get going. This gun is a nice fit in the hand and the lightweight nature combined with the fluid action means you’ll find yourself powering through even more ambitious nailing projects at a prodigious rate. Once you’ve got your compressor ready to roll and your nailer connected, you’ll be able to flick between contact fire and bump fire by hitting a switch. The nose is designed in such a way that if a jam occurs, you can take care of this easily and tool-free. The high-capacity 100 brad magazine is a bottom-loader and lets you pop in up to 100 brads depending on what size they are. This is more or less standard for nailers in this class. You won’t just work quickly with the Hitachi. You can use the ergonomic dial to tweak drive depth so you’ll get a great finish in next to no time. You can move the exhaust around so whatever your working on is nicely safeguarded from any fumes expelled. You’ll get little by the way of extras with the Hitachi but you can’t really expect a shower of accessories at this price. You will get a hard case included along with a pair of safety glasses so your nailer will be safe at home or on site and so will your eyes. As long as you’re not expecting a commercially-rated nailer and you’re happy with the build quality, what else does the Hitachi do to entice you in? 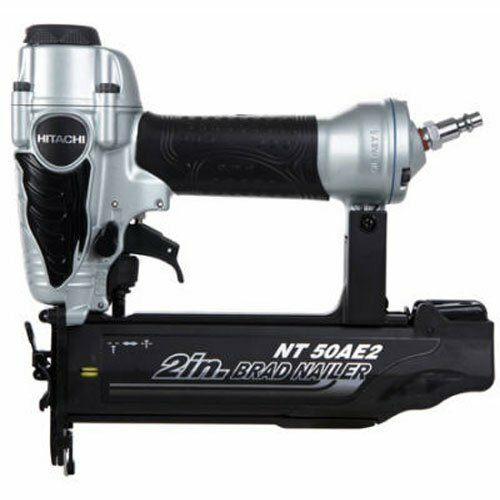 If you want to buy into the brand heritage of Hitachi without spending a fortune, this highly affordable and incredibly versatile brad nailer hits the spot in no uncertain terms. When you need to get lots of nailing done in a hurry, you simply can’t rely on a hammer even if you’re fit and willing to use one. At the price of the Hitachi, you’ll recoup your minimal investment the very first time you fire it up so road test one today and you’ll be nailing at full clip tomorrow. 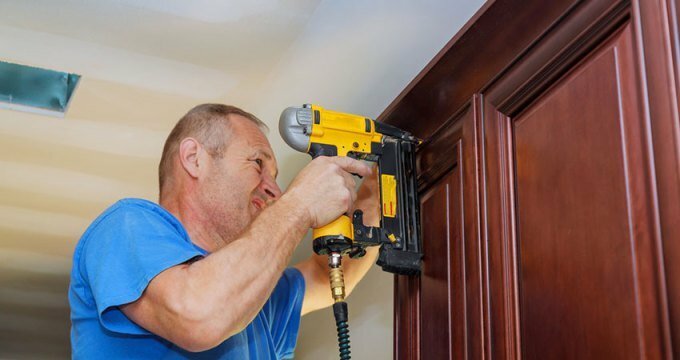 Whether you’re carrying out some small home improvements, tacking some furniture together or attaching trim to cabinets, brad nailers really are in a league of their own. Last up in our brad nailer reviews is the phenomenal P320 Airstrike from the stalwart Ryobi. If you’re looking for the cheapest brad nailer you can get, check out on of the other more pocket-friendly options we looked at. If, on the other hand, you want a hard-hitting nailer which doesn’t call for a compressor, give some serious thought to the Ryobi P320. I finally got around to using this for a current remodel project and I am very impressed! It works great and you adjust the air pressure and the nail feeder actuator to help with under and over-driving. It consistently fired without any further adjustment as I used the tool. To be free of an air compressor for this type of tool is a wonderful thing– especially when you are laying a floor, installing trim, or faux beams. I plan to buy the other air guns from Ryobi to replace other compressor-dependent guns. Thanks, Ryobi for inventing this! Maybe you’ve always fancied trying out a cordless brad nailer but you imagined they’d be lacking in power. The Ryobi will make you rethink that offering you all the grunt you need for projects in the home workshop and even the occasional foray out on site. You should be clear front and center that the Ryobi is by no means the lightest nailer you could buy. Adding the battery bumps the weight up to nudging 7 pounds so make sure you’re OK handling this. In the interests of fairness, it’s tough to compare this to an air-powered model since they don’t need a motor. All you need to concern yourself with is whether or not you’ll be happy handling that weight for the kind of work periods you have in mind. If you’re accustomed to using a pneumatic gun, you’ll be rewarded with near-instantaneous firing. With the Ryobi, there’s a minor lag which, while noticeable, is perfectly normal. If you find this bothersome, use contact actuation which will go at least some way toward mitigating this. As with all the brad nailers we’ve reviewed, you can use nails from 5/8 inch up through 2 inches and you won’t be restricted to any specific brand. You’ll be able to fire away at the rate of 50 nails a minute so you can get both speed and accuracy with the Ryobi. The manufacturer’s claim of 700 brads before you’ll need to recharge is reasonably accurate and you should expect that kind of performance which is more than enough for most trim work. Workshops can be gloomy places and you might also be working out on site where there’s too little light for comfort. You’ll get a pair of LEDs on the Ryobi so you’ll enjoy a plain line of sight on your workpiece at all times. The Airstrike has a no-mar tip so you won’t go scuffing up your wood in order to shave off a few minutes. Pads and bumpers further safeguard your workpiece and mean you can rattle out those brads without fearing for scratches or scuffs. Dry-fire lockout also puts paid to the incredible frustration of spoiling your project at the last minute. Making little adjustments to the depth of drive is intuitive and straightforward. Crowned with Ryobi’s class-leading 3-year guarantee, you can buy this nail gun without any jitters. 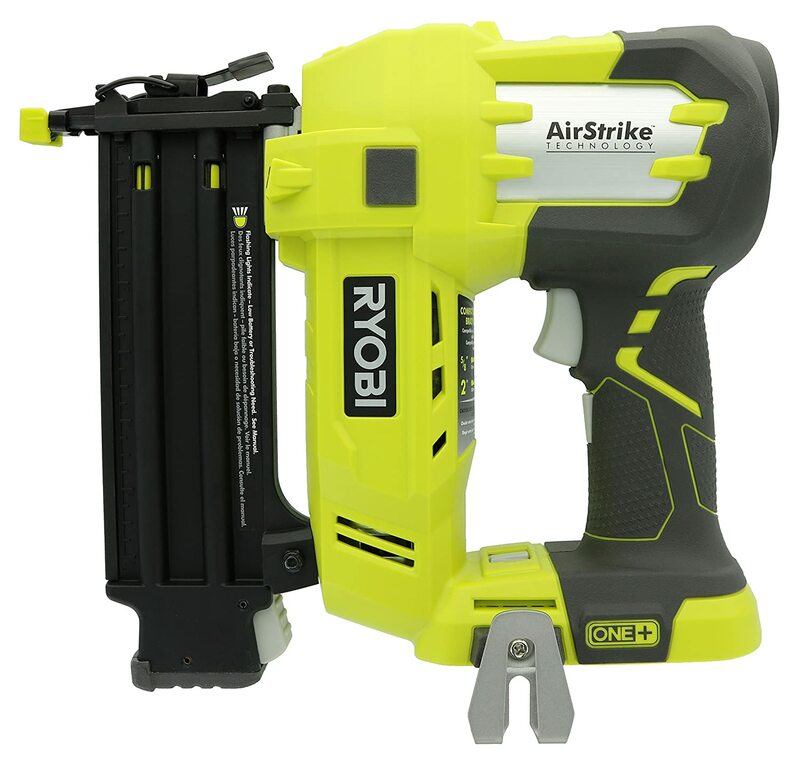 For anyone who’s been considering a nail gun but doesn’t fancy investing in an air compressor, the Ryobi Airstrike makes perfect sense. If you already use Ryobi’s One+ range of tools, you can slot in your existing battery making an expense proposition a whole lot cheaper. For the DIY hobbyist and the serious contractor alike, the Ryobi P320 deserves a place in any collection of the best brad nailers 2018. Now you’ve got a solid overview of what the most effective brad nailers do and which one might suit you best, we’ll round out with a buying guide to further streamline and simplify your buying decision. If you undertake any kind of small and detailed woodworking or crafting projects, there’s every chance the best brad nailer will be an essential part of your kit already. Both these nailers look the same at a glance. They also use similar nails. The difference comes in the subtly thinner gauge nails used by a brad nailer making them ideal for the most tasky and involved projects. So whether you’re toiling away in the workshop at home or you need something for the worksite, a great brad nailer is a key purchase. When you’re looking for a nail gun, the first thing you should do is think about your budget and stick to it. Buy the best you can afford without overextending yourself. The inbuilt advantage of this approach is that you’ll immediately whittle down your options without actually needing to do anything. Reading through a good chunk of user reviews is a great way to see what genuine customers feel having parted with their hard-earned money. Check out reviews rating the nailer somewhere in the middle for a balanced perspective. Being fully aware of all the basics of the tools you’re looking to buy is another way to avoid costly blunders. 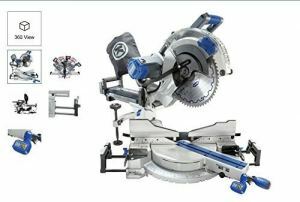 As with all woodworking tools, you should be looking for quality first and foremost. A solid tool collection is built over time and never stints on quality in the quest of saving a couple bucks. 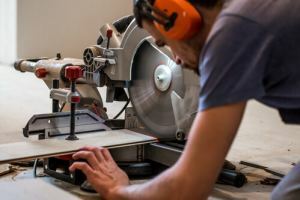 First up, think about whether you want to use a standalone nailer or you’re happy to connect up a pneumatic model to an air compressor. We’ll set aside fuel-powered variants as they’re far less common. Once you’ve got the type of nailer penciled in, what next? If you’re going for a pneumatic model, you need to factor an air compressor into the equation if you don’t already have one. From there, you’ll need to price up the ongoing cost of nails so you can work out whether or not a nail gun is affordable or whether you’ll end up regretting the expense. Get your budget locked and loaded then stick to it unwaveringly. 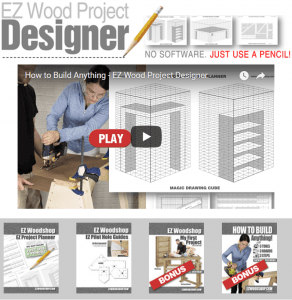 How you plan to use your brad nailer dictates the kind of model you should look into. Are you just a casual home hobbyist or DIY enthusiast? If so, even the very cheapest brad nailers will be more than enough for your needs. There’s no need to spend a large amount if you’ll only use it from time to time. If, on the other hand, you need to use a nailer out on the job site for extended periods on more challenging applications, you’ll need to look for a much more rugged nailer designed for that purpose. Most of the best brad nailers come with a nail length limit of 2 inches or 2 1/8 inches. As with all aspects of your purchase, think about what you need from your gun and buy accordingly. If you routinely use 2-inch nails, it’s well worth considering a 2 1/8-inch nailer. Most of the time, when you’re using a brad nailer, you’re working in confined spaces. Since you’ll also be prizing accuracy when you’re working on detailed finishing projects, it pays to look for a nail gun with the nose designed to make your life easier. Look for tool-free depth adjustment if time is really of the essence. Most user reviews will flag whether or not making these tweaks is easy or not. While this might not seem worth mentioning, keeping your tools safe is that much easier when you’ve got the proper protective covering in place. Don’t underestimate the importance of a hard carrying case, especially if you’re working out on site. Fumes spewing out all over your workpiece is a menace unless your brad nailer has a fully directional exhaust. Look out for nailers that allow you to direct those fumes wherever you choose whatever angle you’re working at. With the brad nailer basics covered, what’s the deal with maintenance? Once you’ve got yourself the best brad nailer for your needs, the great news is that upkeep is as close to nil as it’s possible to get. Aside from a little lubrication, there’s nothing you need to do. Just look after your nailer well when it’s being used and always store it in its protective case and you should get plenty of service from your nailer without needing to constantly look after it. After all, it’s pointless buying a labor-saving device that only ends up requiring more work. 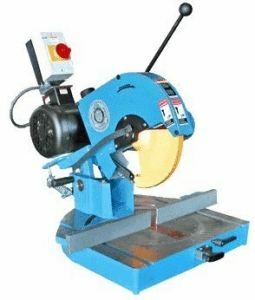 We very much hope you’ve enjoyed these brad nailer reviews and you’re now well placed to find the most suitable model for your finishing needs. These are not complex products but it will repay a little time and effort thinking things through so you end up with just what you need. Drop us a line any time if you’ve got any queries or feedback at all. We’re very responsive to messages and we’ll get back to you as promptly as we can. We’ll round out today with a compendium of the most frequently asked questions about nail guns. Come back next week for our framing nailer reviews if you have more robust nailing needs. 1) ARE BRAD NAILERS AND FINISH NAILERS THE SAME? No, they’re not. They might look roughly the same and take small nails, but the smaller brads used in brad nailers mean they’re better for more detailed work. 2) ARE NAIL GUNS SAFE? In a word, no. With nearly 40,000 Americans seeking hospital treatment after nail gun accidents each year, it’s essential you take your time to familiarize yourself with your nailer fully so you don’t become one of those statistics. 3) WHAT’S A CONTACT TRIGGER? This type of trigger will fire when the trigger and the safety contact are both activated. It doesn’t matter which order you depress them in, the trigger will still fire. 4) WHAT IS A FULL SEQUENTIAL TRIGGER? You need to activate things in a specified order as the name of this trigger suggests. First, you need to push the safety contact tip into the wood, and then you squeeze the trigger. To fire again, you need to release the trigger and go through the motions again. 5) WHAT IS A SINGLE SEQUENTIAL TRIGGER? Much like the full sequential, the single sequential will only fire when you’ve pushed in the safety contact then pressed the trigger. The difference comes when you want to fire again… All you need to release is the trigger. You can keep the safety contact where it is. 6) WHAT IS A SINGLE ACTUATION TRIGGER? This is a bit like a contact trigger in that you can fire your gun once the trigger and safety contact are activated, regardless of order. Keeping the trigger depressed allows you to fire again by just pushing the contact in. 7) WHAT IS A SWIVELING AIR CONNECTOR? These only come with pneumatic nailers. These connectors do a great job of stopping the hose from tangling up so it’s worth considering if you’re going the pneumatic nailer route. 8) WHAT SAFETY GEAR IS NEEDED WHEN YOU’RE WORKING WITH A NAIL GUN? You need a good pair of safety glasses as standard. 9) WHAT IS EASY-JAM CLEARING? Since nail guns will always end up jamming and misfiring, all the major manufacturers address this and offer up some kind of mechanism that at least lessens the chance of this happening and also makes clearing jams much easier. 10) WHAT’S A STRIP-STYLE NAILER? You use long strips of nails with this type of nailer rather than the coiled style on some models.